Identification: Upperside is gray-brown; forewing has a black subapical patch with 3 small white dots inside it. 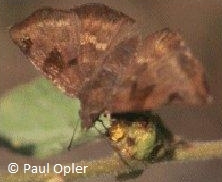 Underside is orange-brown; hindwing has irregular white median spots. Life History: Caterpillars feed on leaves and rest in shelters of rolled or tied leaves. Flight: September in South Texas; May-June in Mexico and Central America. Caterpillar Hosts: Croton in the spurge family (Euphorbiaceae). Range: Bolivia north through Central America to northern Mexico. Has strayed to the lower Rio Grande Valley, Texas.